When you’ve got a bathroom that’s short on square footage, that doesn’t mean you have to think small with style. Instead, to maximize the space, you can incorporate savvy design strategies that cater to a smaller bathroom layout. By thinking strategically about bathroom components, colors, features and accessories, you can design a small bathroom that makes a big impact. 1. Opt out of a bathtub. There’s nothing quite like a long soak in the tub — if your bathroom has the space for it. In a tiny bathroom, a tub’s just not worthwhile. Because they take double the floor space than showers, tubs monopolize too much of the bathroom and make a small space feel even smaller, with less room to move. 2. Go with a frameless glass shower door. The beauty of a stand-alone shower is it takes half the space of a tub, provides a fast and convenient way to get ready every day and, with the right design decisions, can look sleek and stylish. When space is at a premium in the bathroom, forget shower curtains and go for a frameless glass shower door. A glass panel creates a clear visual line in the bathroom, expanding its spacious feel. Glass panels also let in more light, and they’re easy to install. 3. Float the vanity. There’s no law that says your vanity has to sit on the floor. Try saving floor space by lifting the vanity up and mounting it to the wall. Wall-mounted vanities free floor space and make the bathroom feel bigger, with more flooring exposed. 4. Float the toilet. Take a cue from your floating vanity and apply the same idea to your commode. While every bathroom needs a toilet, you can save some floor space with a wall-mounted toilet that floats off the floor. You’ll need space in your walls to build in a toilet tank, but then you’ll get to float your toilet off the floor, saving floor and leg space. 5. Use continuous flooring throughout. As long as you’re going with a stand-alone shower and a frameless glass door, take advantage of the seamless feel further by continuing the same flooring from the main bathroom space into the shower. Whether you’re going with tile, concrete or stone, when you continue the flooring throughout the bathroom, it creates a larger, cleaner feel. 6. Contrast floors and walls. One surefire way to make a small bathroom feel smaller is by painting everything in dark hues. Instead, relegate dark colors to the floors only — make light walls feel even brighter when they contrast with the dark colors on your floor. 7. Make mirrors work to your advantage. Mirrors reflect light and make a small room feel bigger, so, to maximize space in your bathroom, use mirrors to your advantage. Consider making a full wall a mirror or extending the size of your mirror above the vanity or along one side of a narrow bathroom space. 8. Find storage on the walls instead of the floor. Save more floor space by planning bathroom storage on the walls instead of the floor. Vertical storage may include a recessed medicine cabinet, shelving above the toilet, metal towel racks or something else. Look at the wall space you have and imagine the possibilities. 9. Go bold with one wall. One place to have some decorating fun in a small bathroom is with an accent wall. Maybe you go with a decorative tile pattern in the shower wall, which is viewable through your frameless glass shower doors. Perhaps you paint one wall a contrast color that’s still in a light, bright shade. Explore pictures in magazines and online to get ideas and make a dramatic statement with a bold wall choice you love. 10. Use pocket doors. One giant space sucker is a bathroom door, which needs open space to swing in and out of the room. Eliminate this need by installing a pocket door, which tucks in and out of the wall, instead. You will have to open the wall to create the pocket, but, in doing so, you’ll free usable space you wouldn’t have had — which makes a huge difference in a small bath. Small bathrooms feel bigger when they’re strategically designed and planned. When you want to make your small bathroom capitalize on space, remember these 10 strategies above. From floating elements to running the same type of flooring through the room and into the shower, there are lots of ways to enhance and expand the feel of your bathroom at home. Beautifying your bathroom is always desirable, but sometimes an upgrade simply is necessary just for practical aspects. Start with making the most of your bathroom storage potential, which often is overlooked. Efficient bathroom storage entails designating specific places for storing toiletries, keeping towels, and organizing items such as hair dryers and electric razors. Ideally, you also can make use of open shelving to display special trinkets or attractive toiletries for decorative appeal. To help you rethink the look and structure of your bathroom storage, here are 10 bathroom shelving ideas to consider. Think of the best aspects of open shelving in a kitchen — it provides places to display attractive pieces, gives the room an open feel, and provides motivation to stay organized — and transition those benefits to the bathroom. Shelves are highly adaptable to unique bathroom configurations. You can custom design them for specific nooks and crannies, or cut them to the exact width of a specific wall. Use shelves to display attractive bathroom toiletries and accessories. Add a shelf above the sink and below the mirror to create a place to keep everyday items that you otherwise regularly have to reach for to use. For many homeowners, the space above the toilet is easy to forget about. Maybe you hang a towel there, but is that the best use of the space? Consider adding shelving to showcase a pretty picture, keep magazines, or house some attractive essentials. In many bathrooms, there is unused space between the top of the door and the ceiling. House extra small items you need in this space, whether those items are toiletries, toilet paper or hand towels. For a farmhouse-chic vibe, find painted crates that you can hang on the wall and use for functional storage. Other ideas along this vein include using shelves made of reclaimed wood, or add vintage furniture pieces. 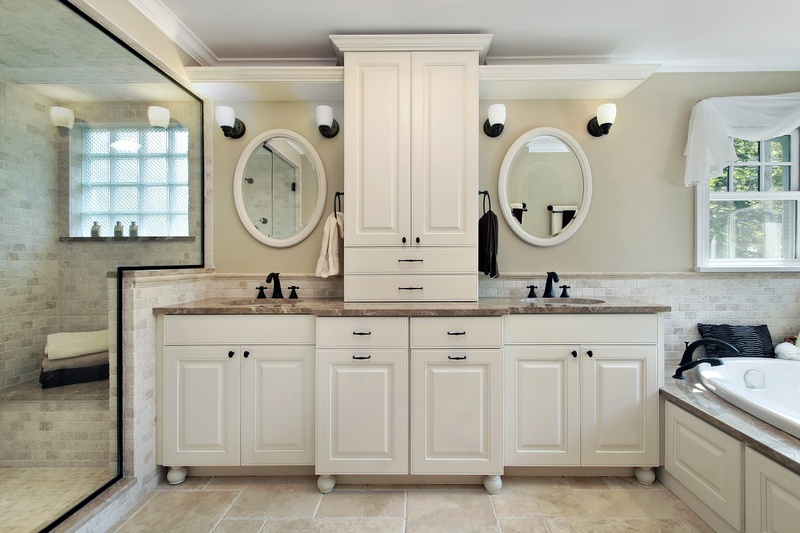 If your bathroom vanity is basic cabinetry, it probably has underutilized space. Make the most of your storage square footage by installing shelving and/or organizers into your cabinetry. Start by thinking about the ways you want to use the space (i.e., what you want to keep in the bathroom), and organize according to that idea. If your bathroom has or can fit a closet, make the most of it with clever organizers. Whether you go with shelving, cubbies or something else, you can find ways to maximize every bit of space. For a shelving look that reflects light, goes with everything and adds some contemporary appeal, consider glass shelving. Whether it’s tucked into cabinets or on display, glass shelving is a beautiful bathroom storage choice. 9. Inset Shelves with Pops of Color. Instead of building shelves onto a bathroom wall, build them into it. Creating cubbies maximizes square footage and takes advantage of previously unused space. Then paint the inside of the cubbies with a bold color such as red, yellow or peacock blue — or wallpaper them with a fun pattern you love. Not only will this maximize storage space, but it also offers a decorative complement to the room’s design. In situations where you aren’t ready to commit to permanent storage solutions in the bathroom, freestanding shelving is another great option. Find a tower, ladder or other piece of furniture that you can bring into the bathroom, and use the steps or shelves for storage. Whether your bathroom is tiny or spacious, the right shelving solutions can make a big difference in its overall usability and appeal. So take some time to evaluate the effectiveness of the storage in your bathroom — and then turn your room into a more useful, efficient and comfortable space for you and your family to enjoy. European chic is trending this year, which is a great look for people who may not have a wealth of floor space. European designers definitely know how to squeeze a huge amount of value and luxury into a room. If you have a small bathroom that you are looking to upgrade, try one or more of these European design ideas for your interior décor. One of the best ways to get a little extra privacy in a small bathroom is to suspend a mirror in front of the window. From this centerpiece, you can place smaller matching accents and rugs around the bathtubs and bathroom sinks without taking much space. The wallpaper that you choose can give even the smallest bathroom the illusion of more space. Lighter colors with sparse designs are the way to go if you need to expand the room a bit. Depending on your taste, your accents can match the color or contrast it to draw the eye, giving the illusion of a bigger room. Expanding on the tip above, contrast that makes the eye move tends to create the illusion of a bigger space. If you really want to dive deep into European decor, go with a strong contrast with the central elements in your bathroom. Use solid, deep colors without complex designs to keep the room from looking too busy, which shrinks the space. Hexagonal tiling is the current style coming out of Europe. It is an eye-catching shape that tends to centralize itself in the space and serves as a good contrast to solid colors on your walls. If you do not have big, ornate pieces in your bathroom, using your tiling to add a bit of panache is a great way to spruce up the room without spending a great deal of money for expensive accents. Exponential room expansion can be accomplished through the judicious use of mirrors. Corner mirrors are specifically European — a look that may not be for everyone, but definitely sets the room apart for those who are bold enough to try the look. The most forward-thinking interior designers are placing small mirrors at the corners of the bathroom above the sink. Many of the best European designs base themselves on a centerpiece from a particular time period, such as a Baroque mirror or a vanity of French limestone. Not only do you now have a styling that draws the eye, but you also create a sense of fantasy within your bathroom that makes every experience there more enjoyable. Another European-influenced choice is nautical decor — shipshape accents led by porthole windows and hexagonal floor tiles. Use contrasting bands on your bathroom walls to finish the look and create an exciting journey for yourself every time you wash your hands! Another aspect of Europe that you can bring into your bathroom is the rustic landscapes of rural, widespread countries like Switzerland. Some of the best designers are even using chicken wire in their bathroom designs along with screening instead of traditional cabinet doors to ramp up the feel of the country. After all, this is how towels and other bath cloths were presented in the past, so why not return to a great tradition to give yourself a new look? Depending on the laws of your state, you may or may not be able to have tinted windows on your car, but you can definitely have them in your bathroom. Slightly distressing your mirror can give a bit of color to the space without a need to repaint the entire room. In a smaller bathroom, you must find a way to store your toiletries more efficiently if you do not want to create clutter. If you do not have a separate linen closet, you can invest in a deeper medicine cabinet that interacts with the piping in your bathroom. Many smaller European bathrooms incorporate these deep cabinets, staggering storage space around pipes. Use the extra space for custom bathroom vanities that will hide your laundry bins, giving you plenty of room for dirty linens and clothes without cluttering the room. European design always seems to add a bit of modern flair to your feng shui, and it can do even more with your ideas incorporated into European traditions to create a beautiful hybrid. Keep the above tips in mind for your bathroom, and experiment with your own design choices to create new and exciting options for your bathroom! If you’ve recently renovated your bathroom and have leftover PVC pipe, don’t toss it out or throw it in the attic. Aside from the functional uses of the pipe, like irrigation and plumbing, there are more creative ways to use it around the home. It’s one of those ordinary construction materials that’s cheap to buy, simple to find, and easy to work with; therefore, it’s the perfect material for a variety of DIY projects. With some creativity and a little bit of elbow grease, you can create a smart storage solution for your hairdryer or a chic succulent planter. Here are some of our favorite creative uses for PVC pipe in the bathroom. If you live with a woman, or are one yourself, chances are there’s some hair devices stored throughout your bathroom. 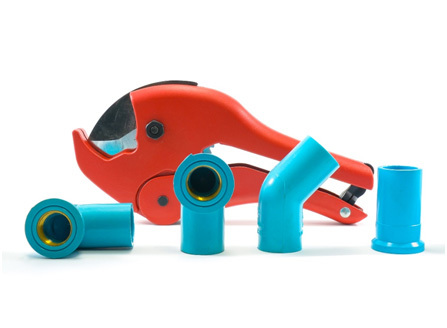 Whether it’s a blow dryer under the sink, a hair straightener on the counter, or a curling iron in the cabinet, you can use old PVC pipes to keep them safe and well organized. The shape of a PVC pipe connector makes it the perfect place to store your hair dryer or flat iron. If you’d rather not stare at ugly, white PVC pipe, paint the pipe your favorite color or design it so it blends in with the rest of your bathroom’s décor. Do you have a mirror in your bathroom and want to refresh its look without spending tons of cash on an expensive frame? You can take a PVC pipe, cut it into rings, and make a frame for your mirror. You can use pipes of different thicknesses and sizes, and mix and match different colors for a more bohemian look. Decide the layout before you cut the pipes, and don’t forget to sand the edges before gluing the pieces together and creating the frame. The only materials you’ll need are a hand saw, PVC pipe, and adhesive. For a step-by-step guide, check out the Better Homes and Gardens’ tutorial. If you’re anything like the rest of us, your bathroom countertops are likely cluttered with toothbrush tubes, makeup supplies, and other bathroom accessories. Fortunately, old PVC pipe painted in a bright, beautiful color is an easy and cost-effective way to organize your bathroom countertop. Simply use a hand saw to cut the pipe in random lengths, spray paint them in your favorite color, arrange them in a manner you’re happy with, cover the bottom with cardboard, and voila! You have yourself an effective and unique way to store and display your bathroom necessities. If you end up liking this storage option, you can use it in the office or kitchen, too! Succulents or fresh flowers displayed on a bathroom vanity countertop are not only pleasing to the eyes, but it can help improve indoor air quality. Since succulents tend to have shallow roots, the DIY pots don’t have to super long in order to get the job done. Choose the best option for your space- long pipes are ideal if you have a lot of vertical space on your counter, while shorter PVC pieces can easily be substituted for pots or vases. To take the personalization a bit further, use a sharpie or spray paint to decorate the DIY pots or planters. If your child loves playing in the bath (and you don’t mind the “mess”) you can use PVC pipe to build them some unique toys to play with while in the tub. Simply get some PVC pipe elbows and T’s, fix them to the wall with suction cups, and arrange them in different ways. Since the suction cups aren’t permanent, your child can easily move them around whenever they want something new. They can create a complex snake shape, pour water in from the top, and wait until the water falls out of the bottom. Your master bathroom should be different from the rest of the bathrooms in your home. After all, it’s a relaxing and accommodating attachment to your master bedroom. While it’s common for homeowners to crave an element of grandeur in their master bathroom, there are a number of ways to take a simple and budget-friendly approach to its design. Here are some tips for making a statement, while still creating a serene environment that you’ll get the most out of every day. When it comes to your master bathroom, the shower should be one of your top priorities. You’ll either be starting or ending your daily routine with a shower, so you’ll want to make it something to look forward to. With this in mind, you should look for a fairly large shower head that allows for consistent water flow and a wide range of temperatures. If you’d like, you can search for a shower head with adjustable settings or a detachable handheld component. Regardless of the type of shower head you choose, the result should be a thorough and relaxing shower each and every time. Additionally, you can look into adding a bench or some easy-to-reach shelves so you can conveniently place everything you need in the shower. While a shower may be a more practical and efficient way of getting clean, sometimes you want a different way to unwind. This is why you should consider a spacious and comfortable bathtub in your master bathroom. Having the option to sit back in a hot bath after a long day can be extremely peaceful and stress-relieving. Look into adding or designing a bathtub with some depth, and make sure that it provides consistent and easily adjustable temperatures so that the water always feels just right. Similar to your shower, your bathtub should have enough surface or counter space to place all of your bathing products close by. Your master bathroom should be functional, but it can also be your place of solace, and if you enjoy a hot bath on occasion, then make sure your bathtub is the perfect fit. Since you’ll be using your master bathroom to get ready every day, a decently-sized and well-lit mirror is sure to be appreciated. If you’re sharing your master bathroom with your partner, then you might benefit from having a dual-sink vanity so that each of you can go about your morning routine with plenty of space. Consider a bathroom vanity that has a large mirror and plenty of lighting so that you can have a detailed view when you’re shaving, putting on makeup, or brushing your teeth. You’ll want to make sure your master bathroom is well-ventilated, that way you aren’t looking at a foggy mirror after a hot shower or bath. Remember to keep your toiletries close by in baskets or drawers, so all your favorite products will be within an arms’ reach. Finally, you’ll want to make sure your master bathroom’s flooring can handle your day-to-day life. Tile floors that can withstand the moisture from water and steam are incredibly important, as mold can grow quickly in this kind of atmosphere. In order to avoid slipping on a slick surface, you’ll want to place absorbent and firm mats outside of your bathtub and shower. Look for mats that will feel good on your feet and won’t slide on your tile floor. Not only should they be aesthetically pleasing, but these mats should be able to handle moisture and provide some traction so you’re not slipping around on the floor in your master bathroom. Your master bathroom should be set apart from the ‘ordinary’ bathrooms in your home, as it’s meant to accommodate your day-to-day life in the most comfortable and relaxing way possible. While it should be functional, you’ll be very pleased if you put some effort into making it your own little luxurious getaway within your home. With these tips, you’ll create the idea master bathroom that you’ll look forward to using each and every day.